"This engine has so many knobs and buttons!" No need to panic, we can work through this together. The engine on a Kraken Stealth winch has 4 main controls, the Kill Switch, Gas Shutoff, Choke, and Throttle. The Kill switch kills the engine. The engine will not run or start when the kill switch is engaged, as it disconnects the spark plug in the engine. No sparks, no booms. On the 212 and 301, it is a red switch. On the 420, it is a key. The Gas Shutoff turns off the flow of gas to the engine. If it's not on, the engine will not have fuel and will stop running, which is no fun. 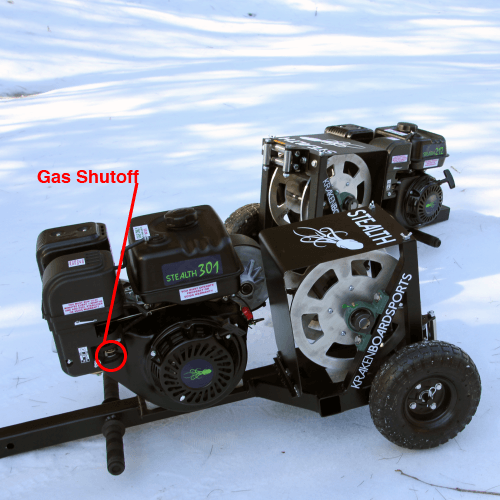 We do recommend that if you are going to store your winch, turn off the gas with the machine running until it stops. This will burn the rest of the gas out of the carburetor and other little parts that can get gummed up from letting the gas sit. The Choke is helpful when starting the engine on your winch. It restricts air getting into the engine to make the engine run rich. Turn it back under normal operation. a) Spooling in line that is not under tension; this leads to tangling. b) Sucking the handle into the fairlead on the front. This is not good under any circumstance. The best winches are working winches  so to keep your winch winching, it is important to take care of the engine. If you plan on letting the machine sit in storage, it is possible the gas can gum up and clog all the little bits in the engine. There are ways to prevent this. 1) Turn off the gas after use, and run the machine until it stops. this burns the extra gas out of the carburetor and such. There is also maintenance schedule that goes with the machine. After running the engine for 20 hours, we recommend changing the oil. If you generally use the machine at above freezing temperatures (above 32° F), use 10W-30. If it's generally below freezing (Below 32° F) use 5W30. Below are some other good practices to follow.